Welcome to the 19th QuarkChain Bi-weekly Report for the period from Nov. 18 to Nov. 29. Testnet 2.0 enhances the openness of QuarkChain and improves the communication efficiency and security of the whole network. Testnet 2.0 includes opening the functions of accounting and verification to the community. QuarkChain’s two-layer structure, communication efficiency, and the core algorithm of distributing network computing power — Boson algorithm, will be verified in Testnet 2.0. QuarkChain will launch mining award. Users who participate in the mining of the testnet and obtain the test tokens (tQKC) can be converted to QKC of the mainnet in a certain ratio after the launch of mainnet (note that Country restriction). Please Check Here for the full update. On Nov.15, ELLIPAL and QuarkChain signed an agreement on a strategic partnership. We will commit to create a safe and easy to use blockchain infrastructure by mutual cooperation in product technology, marketing and developer community. Click HERE for more details. QuarkChain has officially joined Binance_Info and received Gold Label as one of the first round projects. 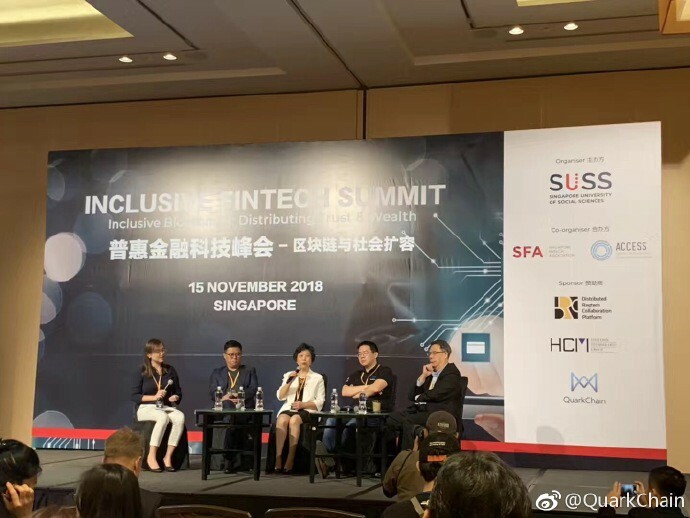 On Nov.15, QuarkChain CBO Ting Du and Research Scientist Yaodong Yang attended Inclusive Fintech Summit 2018 at Singapore. They joined the panel discussion “The Role of Self-Regulatory Organisations”. This summit greatly increased the consensus of QuarkChain on promoting the landing of blockchain technology in all walks of life, and provided a very important opportunity for the integration and development of the whole blockchain ecology. On the afternoon of November 25, QuarkChain CBO Ting Du participated in the “China Financial Science and Technology and Corporate Social Responsibility Forum 2018” sponsored by China Enterprise News in Beijing. As an invited guest, Du Ting gave a keynote speech on “The Second Half of the Financial Industry and the Expansibility of BlockChain Technology”. QuarkChain, ANT Financial Services Group and Jingdong Finance won China’s Most Potential Value Financial Science and Technology Enterprise Award. On Nov. 26, QuarkChain, the new generation of high throughput and flexible public chain, held a live broadcasting activity on the release of the Testnet 2.0. Dr. Qi Zhou QuarkChain founder and CEO, Anthurine Xiang QuarkChain CMO, together with Lu Zhang, the managing director of JRR, conducted a live to introduce QuarkChain’s characteristics in the form of questions and answers. They introduced new functions of Testnet 2.0, and have conducted many rounds of interactive and award-winning Q&A with live viewers.